An organised garden tour is a bit of a mixed bag. You see many more gardens in the time available and have a helpful well-informed guide but the disadvantages are that you’re hurried, and often haven’t time to take all the photographs you want and perhaps don’t get that inspirational feel for the place. 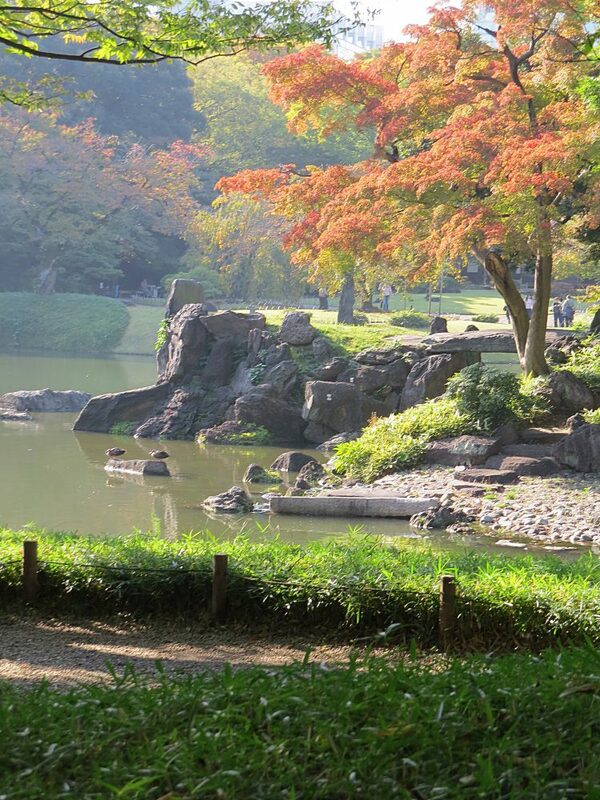 Koishikawa Korakuen is a case in point. 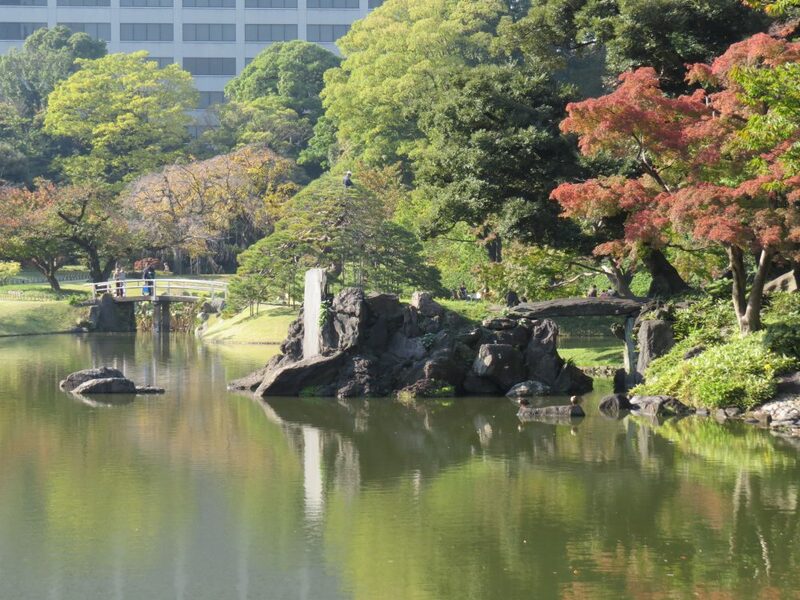 It is one of Tokyo’s best stroll gardens with breath-taking views, especially over the large central pond (Dai-Sensui) with its stunning composition of stone, water and pine trees. I wish I had been able to spend more time there. Winding stone paths lead off past small rounded hills into groves, including the Ume Grove of 30 different types of plum blossom at its prime in early February, and the Paddy Field (Inada) block planted with Japanese iris in mixed colours, at its best in late April. Most of the buildings and the Chinese gate (Karg-mon) were destroyed in World War II and not rebuilt, however the Full Moon Bridge (Engetsu-kyo) did survive. 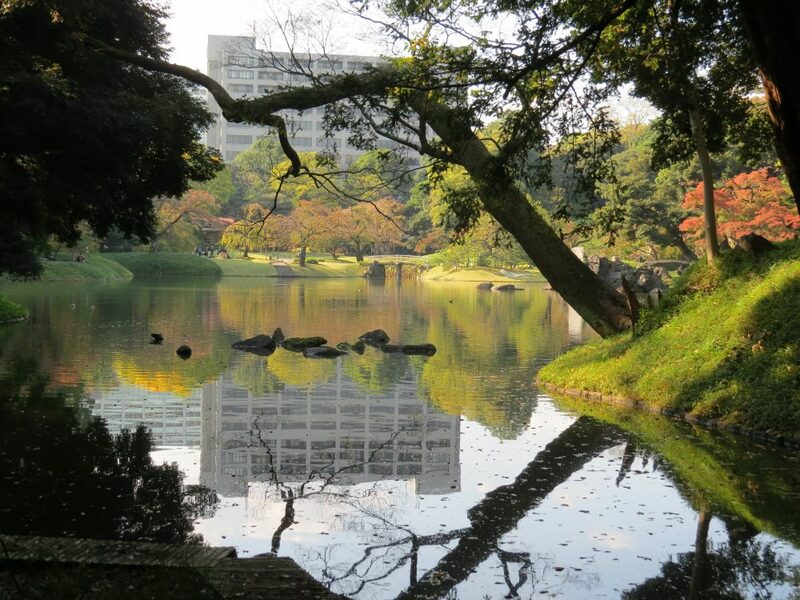 Like that other great Tokyo garden, Hama-rikyu, it is a wonderfully calm and contemplative place. 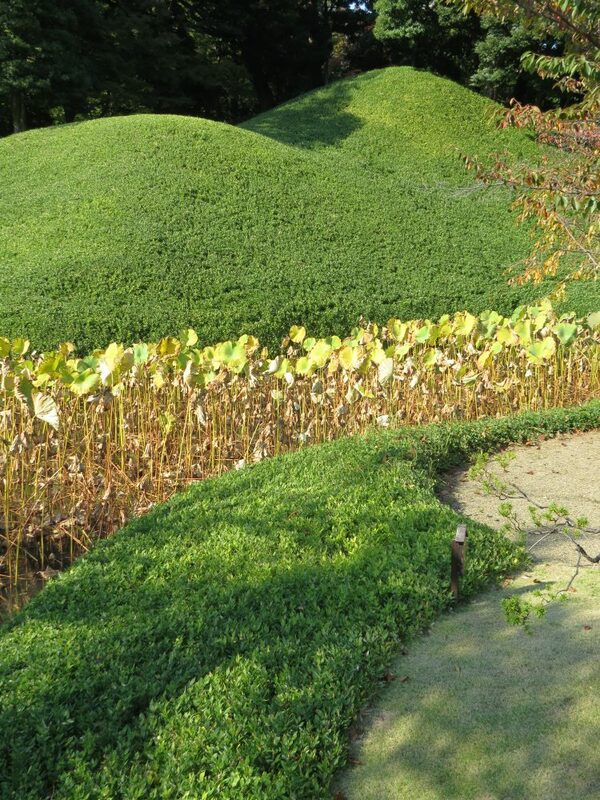 The garden, owned by a branch of the ruling Tokugawa clan, was laid out in 1629 and completed thirty years later and is unusual in that it has strong Chinese influence. In the Tokugawa era (1600-1867) there was a revival of interest in the humanistic philosophy of Neo-Confucianism by the warrior class and governing elite, and Zhu Zhiyu, a Confucian scholar at the Chinese Ming court was invited to design the garden. Most modern scholars consider Neo-Confucianism to be the keynote philosophy of Tokugawa Japan and it stresses the unity of the three great Japanese philosophies and religions – Buddhism, Confucianism and Shinto. Emphasis is placed on the greater good over self-interest, and on strong family loyalty, ancestor veneration and respect for elders as the basis for good government. What makes modern Japan so unique to visitors is that this philosophy still strongly permeates society as indicated by strong families and low divorce rates, low levels of crime, loyalty to company and respect for others, but the unbending and inflexible hierarchical system leads to much stress and high suicide rates, especially in junior executives. Japan is a sort of parallel world, and as well as its vibrant modern culture and wonderful artistic and inspirational garden legacy, its philosophical legacy has much to teach the West.